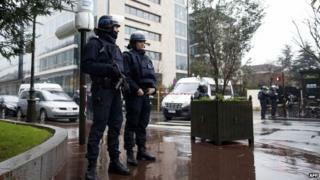 Charlie Hebdo attack: A French intelligence failure? Nearly every modern terrorist attack is followed by accusations of so-called intelligence failure. In the case of this week's attacks in France, the charge has added force: the suspects were known not just to French but also to other European and American authorities; one had travelled to Yemen over a three-year period and another had been convicted of earlier seeking to travel to Iraq; and they were plugged into long-established European jihadist networks. So did the French drop the ball? The answer isn't clear-cut. True, the suspects weren't unknown quantities. Cherif and Said Kouachi, who committed the Charlie Hebdo massacre, Amedy Coulibaly, who took hostages in a kosher shop, and Hayat Boumeddiene, Coulibaly's girlfriend, were connected both to each other, and to a large network of extremist organisers in Europe. The younger Kouachi, Cherif, had been jailed for seeking to join Iraqi jihadists nearly a decade ago. In prison, he was mentored by the al-Qaeda-linked Djamel Beghal, who himself had spent time at Finsbury Park mosque in London, where he was an associate of the radical cleric Abu Hamza. The older Kouachi undertook military training in Yemen in 2011, where he met the influential preacher Anwar al-Awlaki. Awlaki was a senior figure in al-Qaeda in the Arabian Peninsula (AQAP), the branch of al-Qaeda that has proven most effective at placing bombs on Western-bound aircraft, and which claimed responsibility for the French attacks. It is important to remember, however, that thousands of people would have been connected to these very same networks, some of which are well over a decade old. On top of this, more than 1,000 French nationals - a large proportion of whom would be previously unknown - have travelled to Iraq and Syria to fight with Islamic State in the last few years. About 200 have returned. France has unusually powerful intelligence agencies, but no Western agency has the legal powers or manpower and resources to conduct intrusive and constant surveillance of thousands of citizens who have not been charged with any crime. As one French intelligence officer told the New York Times, "we would need to triple our staff to better protect [Paris]". How do you zero in on true threats? The challenge is to identify which networks of individuals deserve further attention, on the basis of limited information. That information is even more limited if plots are developed without foreign direction, which minimises possibilities of eavesdropping, and where plots use more easily available resources, such as guns rather than sophisticated explosives. It would therefore be unfair to blame the French for reportedly dropping their surveillance of Said Kouachi after his return from Yemen without a clearer understanding of the competing threats, and what that initial surveillance had turned up. In other words, before calling this an intelligence failure, we need to better understand the size of the needles and that of the haystack, and the quality of the sifting process. Did clues slip through the net? There is reason to think that the French failed to get some information they ought to have had. The Kouachi brothers had succeeded in building up a cache of arms in their apartment. Neighbours discovered that cache, but they were then intimidated into silence. This, however, might represent more a failure of local policing - and poor relations between the local Muslim community and the authorities - than national intelligence. Nevertheless, assault rifles and rocket launchers are not easily available in Western Europe, and the French authorities could reasonably be expected to have had a tighter grip on the supply networks. Image caption Should the authorities have realised the killers had obtained sophisticated weapons? We might also ask whether French authorities and their foreign counterparts, especially those in Yemen and the US, shared intelligence that might, taken together, have thrown up insight that the individual portions could not. One report suggests that France de-prioritised the Kouachi brothers because Yemen was a US priority, whereas American officials left it to the French. France, it should be remembered, is not a member of the US-led Five Eyes intelligence alliance. Did international terror groups play a role? We increasingly, but simplistically, seek to place terrorist attacks into one of two categories: low-tech, independent operations by individuals ("lone wolf") or small groups ("wolf packs"), or complex and large operations resourced and commanded by organisations. The last six months has seen a profusion of low-level attacks across Europe and North America, giving the impression that even slightly larger attacks - involving higher-calibre weaponry or better preparation - must represent formal plots by established terrorist groups. In this case, the attackers themselves claimed to have been sent by AQAP, which itself claimed to have "directed" the plot. But we should treat this claim sceptically. As the Australian counterterrorism analyst Leah Farrall reminds us, the al-Qaeda operatives who attacked US embassies in 1998 were given only general instructions to strike Americans. Al-Qaeda's leadership learned of the targets while the attack was under way. This is closer to inspiration or encouragement than direction or command. This may be the model in the Paris attacks, particularly as AQAP's past plots have been built around advanced bombs rather than the use of gunmen. Amidst the rise of IS, al-Qaeda - and especially its Yemeni branch - remains a potent threat. There may also yet prove to be a Syria connection, as AQAP has linked up with al-Qaeda operatives there. But much more evidence is needed before we can draw any firm conclusions. The Paris attacks are not a new kind of terrorism. The use of gunmen, the seizure of hostages, the focus on screen-time rather than death toll, and the role played by complex networks of individuals cutting across different countries and groups have been features of attacks over the past 50 years. The new challenge isn't the prioritisation of threats, but the growing mismatch between the number of potential threats and limited resources.